Fighting the effects of aging has always been a challenging process for me, and most times, it’s an expensive one. You know I don’t like the shiny and nonsense cosmetic treatments that are mere marketing tricks. I need solid stuff that works and is effective. That’s why I usually go to salon to get a deep facial with microdermabrasion. It is simple and effective. This is a technique that removes the top layer on your skin which consists of dead skin cells, allowing the newer, healthier ones to come to the surface. Basically, it’s like a buffer for your skin to shine you up. It is straigtforward and really effective, and for a skeptical girl like me, who also likes to feel and look good, this is the right fit. Our skin is constantly producing new cells, and the old ones that die off are left on the surface of our skin while the new ones mature. Microdermabrasion removes these dead skin cells, revealing the healthy layer underneath to create smoother, softer and more youthful skin. 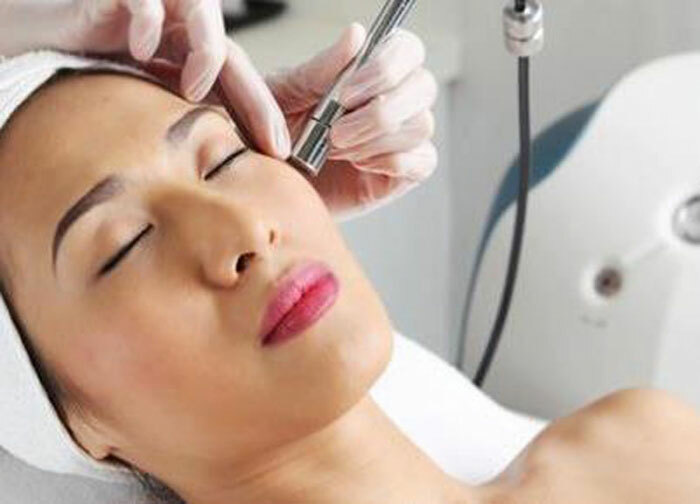 A professional treatment by a dermatologist typically involves a high-tech machine that uses tiny crystals to help break up the layer of dead skin; it then vacuums up those old cells to reveal the new layer of skin. Oftentimes, this type of treatment causes swelling and redness, which is normal. Hydrating after a microdermabrasion treatment is essential to making sure that new layer of skin will be healthy. It also helps the redness to go away. Unfortunately, it doesn’t end at just one session. Several treatments are needed on a regular basis, and with the cost for each treatment being in the range of $100-$200, it can get pretty spendy. How many treatments you need is dependent on what your esthetician thinks you should do, but you’ll most likely be going in about once every couple of weeks. Fortunately, there are ways you can use microdermabrasion treatments at home, and they’re much less expensive. Although creams and face scrubs that use small crystals or beads help to exfoliate your skin, the best and most effective treatment is using your own at-home microdermabrasion machine. You are in control of what areas you want to use it on, and it does everything a professional’s machine would, but at a fraction of what all those dermatologist treatments would cost you! Microdermabrasion machines come in two types of exfoliating tips (the part that buffers your skin): crystals or diamond. Most people use the diamond tip because it’s less messy than the crystals, and some even find it works better for them when it comes to erasing things like fine lines and blemishes. Diamond tips are also better for sensitive skin. Home microdermabrasion machines cost around $300. This can seem a little expensive to some people, but if you’re going to several treatments with a dermatologist per year with each visit costing $200, you are saving a ton of money by having an at-home machine. According to this website, the most popular ones are Microderm MD by trophy skin and Kendal professional machine HB-SF01. You basically get the machine for little more than the cost of a one-time treatment. Those are some serious savings. Microdermabrasion will by no means give you immediate results. Using microdermabrasion treatments takes patience, but after a few weeks you will start to see your skin looking brighter, younger and healthier. It is important, however, to make sure you are moisturizing after every treatment to help the process along, as moisturizers will work more effectively after your treatments. So throw away those expensive exfoliating creams and go with a microdermabrasion machine. Your skin will thank you.